Quickly control mosquito larvae within 24 hours. Great product to use in the TORMADA® application boat. Drive away those pesky mosquitoes! 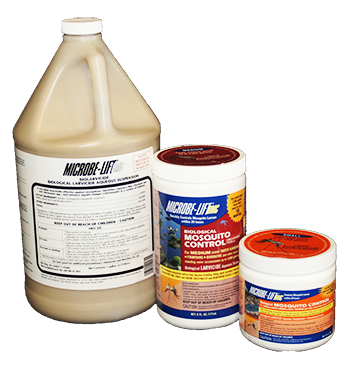 Microbe-Lift® BMC kills developing mosquitoes before they become breeding, biting adults, including those which may transmit West Nile Virus and Equine Encephalitis. Great for use in pond, lakes, water gardens, water features, bird baths, fountains, drains, rain barrels, roof gutters, tanks, and other areas where standing water accumulates. Manufactured by Ecological Laboratories, Inc.
Mosquitoes before they become breeding, biting adults. Use in containerized water where mosquitoes may breed. A microbial insecticide effective against mosquitoes in a variety of habitats. Effective year-round when mosquito larvae are present.